The selection of payment methods that are actually available during the order process may vary. Payment methods may be technically restricted, for instance due to the selected currency, user status or because of the eibabo® online shop that is selected. Purchase on account is available for cities, municipalities, schools, universities, industry, corporate groups, banks, churches, armed forces, police, fire services or governmental agencies or institutions as defined in Sec. 1 IV of the German Administrative Procedure Act (VwVfG). Once you have been assigned a customer number, you will have the additional option to select payment on account. Orders by telephone or fax are NOT possible. You must always complete the online order yourself. A credit check is carried out as standard. Private customers can pay on account using our alternative payment option providers, PayPal Plus and Klarna. You simply pay in advance and get the goods delivered conveniently and inexpensively to your home once the payment is received. You will receive information regarding the amount and bank details in a separate email after submitting your order. 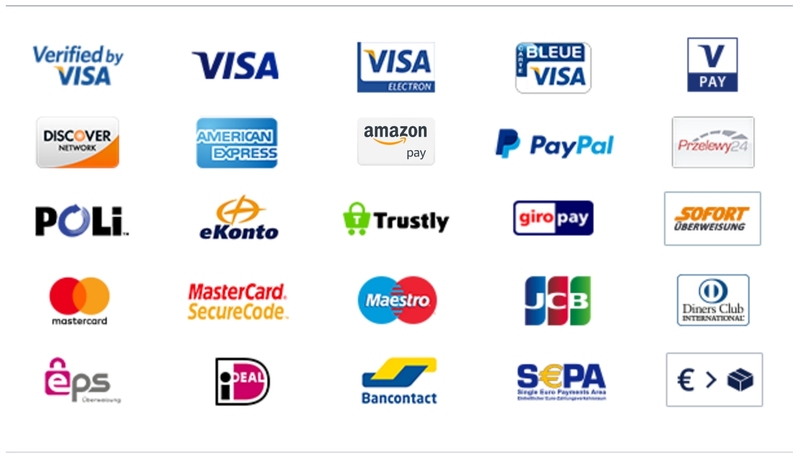 We offer the following payment types with PayPal Plus: Direct debit (SEPA compliant), credit card, purchase on account or classic PayPal payment. You do not need a PayPal account for payments on account, by direct debit or credit card. If you select the classic PayPal payment as your payment method, you will be forwarded to the PayPal website at checkout, where you can log in using your existing PayPal account details. You can also register for a new PayPal account at this stage. PayPal may carry out a credit check, over which we have no influence. Pay securely without having to re-enter your delivery and payment details. By selecting Amazon Pay as your payment method, you can use the payment details and delivery information registered to your Amazon account. You can complete the order process at eibabo® quickly and easily using the existing information stored on Amazon. Your personal details are protected at all times and you benefit from the same buyer protection that you get from Amazon, so you can shop at eibabo® with peace of mind. Use the “Maestro SecureCode” authentication process to pay securely via credit card. With Maestro SecureCode, you identify yourself via a personal security code, to ensure outstanding security when shopping online. To use Maestro SecureCode, you will need a valid Maestro bank card (with 19-digit card number) with an adequate purchase limit and a valid registration for the Maestro SecureCode service. No sensitive data is necessary to pay via EPS transfer in the online shop. iDEAL is a standard payment method for secure payments directly from one bank account to another and it is one of the most widespread payment methods in the Netherlands. If you select iDEAL as your payment method, you will be forwarded to a participating Dutch bank. There you will find the familiar online banking page of your bank, where you can complete the transaction. As you cannot revoke your transfer after order completion, we can ship your items immediately without risk. As a result, iDEAL is not only a secure and reliable payment method, but also enables speedy delivery of your ordered items. “GiroPay” was specially developed as an online payment method for e-commerce and online shopping via online banking. GiroPay allows you to pay quickly, easily and securely at eibabo®. You use the trusted, secure online banking terminal of your participating bank. At eibabo®, you can use the SOFORT cashless payment for quick, secure and simple order completion with an advance payment via online banking. With a SOFORT online transfer, online payment is easier than ever before! All you need are your online banking details, so you can shop with confidence. The transaction confirmation allows us to process your order quicker (than with pre-payment, for example) and send your items immediately. Benefit from the secure and convenient SOFORT payment method and the speedy delivery of your ordered items. Przelewy24 is one of the most widespread online banking methods in Poland. Przelewy24 uses online banking authentication to make transactions in real-time, is supported by all major banks in Poland and is available to 95% of Polish customers via online banking. The payment system has no transaction limit and takes you directly to the payment process via your online banking environment. This ensures quick, convenient and secure order completion at eibabo®. 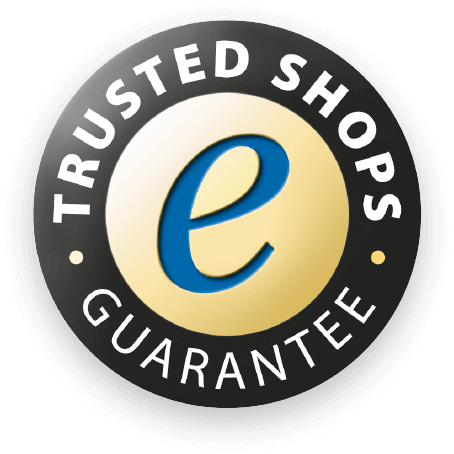 With Trustly, you can pay for your shopping at eibabo® like you would with cash, but via online banking. What sets Trustly apart from other payment services linked to online banking are two key features. As a customer using the Trustly payment method, you are not forwarded to your online banking portal, but must personally select the payment option, including the bank. In addition, the online payment process with Trustly is so simple and convenient that it is almost like a cash transaction in face-to-face sales. To use Trustly, you must have an account with one of the more than 50 banks in eight countries that support this service. Select the “SEPA direct debit” payment method and have the invoice amount withdrawn easily and conveniently from your bank account. Enter your bank details (IBAN, BIC, account holder) at the checkout and give us a SEPA direct debit mandate. The invoice total will then be withdrawn from your account. To meet as many customer preferences as possible, we offer payment on account via multiple providers. One of these providers is Klarna. When you select this payment method, an online credit check is carried out by our partner, Klarna, and if the result is positive, we will deliver the goods on account. Alternatively, we may suggest another payment method. When using Klarna payment on account, items can only be delivered to private individuals without the option to use a different delivery address. When using the Klarna finance service to pay in instalments, you also receive the goods first. Your purchases are then collectively invoiced at the end of the next month. You can pay this invoice in flexible instalments, or pay off the whole amount at any time. Klarna will check and evaluate the consumer’s details and, if there are justifiable reasons, it will initiate information exchange with other companies and credit reference agencies (credit check).